Source: U.S. Energy Information Administration, based on Ventyx Energy Velocity Suite. This is the fifth in a series of five articles on U.S.-Mexico energy trade. Between Southern California and Baja California, electricity is generally imported from a few power plants on the Mexican side to supply demand in the San Diego area. A small portion of the Baja California, Mexico, grid participates in the Western Electric Coordinating Council, which covers the western United States as well as Alberta and British Columbia in Canada. At even lower voltage levels, a few ties connect southern and western Texas with the Mexican states of Tamaulipas and Chihuahua. However, these ties are asynchronous, meaning that the transmission systems on either side can operate independently. Trade mainly occurs during periods of constrained supply within the ERCOT (Texas side) or Mexican transmission systems. Electricity trade between the United States and Mexico has existed since 1905, when privately owned utilities located in remote towns on both sides of the border helped meet one another's electricity demand with a few cross-border low voltage lines. Transmission across the U.S.-Canada border, meanwhile, is more integrated. Mexico has been a very small net exporter of electricity to the United States since 2006. Power sales from Mexico to California more than offset exports from Texas to Mexico in 2010, although 2012 data suggest that Mexico has begun to import more electricity from the United States. 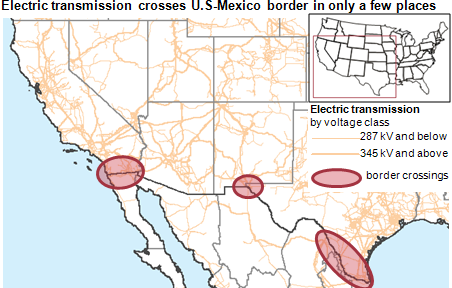 The flow of electricity from Mexico to the United States could increase, as the Department of Energy recently issued a presidential permit to a subsidiary of Sempra International for construction, operation, maintenance, and connection of a 230-kilovolt (kV) transmission line across the U.S.-Mexico border. When completed, the transmission line will supply electricity from a Mexican wind farm to the California market. Unlike in the United States or Canada, the vast majority of power plants in Mexico and the entire transmission and distribution network are owned and operated by a government-owned monopoly, the Comisión Federal de Electricidad (CFE). After Mexico passed the Electricity Public Service Act in 1992, independent power producers were allowed to construct electric power plants and sell power to CFE, leading a number of U.S. companies to build power plants in Mexico across the border from Southern California. For more information, see EIA's Country Analysis Brief for Mexico.